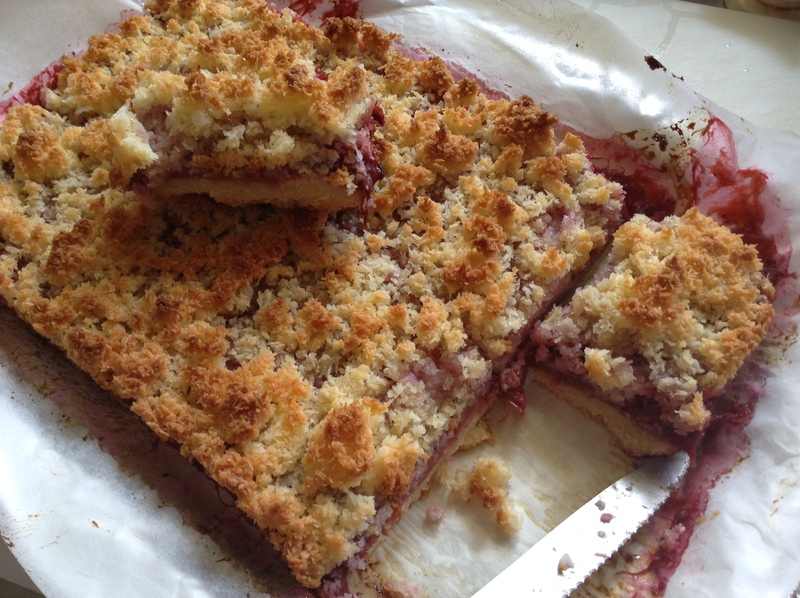 SATURDAY COOKING: RHUBARB AND STRAWBERRY COCONUT SLICE. This recipe is from the West Australian newspaper. Strawberries are just delicious added to the rhubarb. Great combination! It makes a 20cm × 30cm slice tin. To make filling, put all filling ingredients in a saucepan and cook over a medium-to-low heat until fruit reaches a thick, almost “jammy” stage (this will take 20-30 minutes, maybe longer). Remove from heat and allow to cool a little. Preheat oven to 175°C and line slice tin with baking paper. To make base, put flour, sugar, butter and vanilla seeds in a blender. Blend until combined and resembling fine breadcrumbs. Add egg and blend until dough comes together. Tip dough out onto a tray and, using your fingers, press evenly over base to cover. Pop into oven and bake for 20 minutes. Remove from oven. To make topping, mix together all topping ingredients until combined. To assemble slice, spread filling over base, covering evenly. Spoon topping mix on top, spreading evenly. Pop back into oven and bake for 25 to 30 minutes or until golden. I used vanilla paste. And I have never seen raw “caster” sugar, so used just raw sugar. I made the topping and left it in the fridge for a couple of days because I didn’t have time to make the slice on the same day. I cooked it until quite thick. I used a food processor to mix the base ingredients, not a blender (it seemed an odd choice). It’s a beautiful dessert that you could have with cream on the side or icecream. It keeps well for a few days covered. And you could use other berries and maybe add a zest of orange to give an extra lift to the mixture of strawberry and rhubarb.